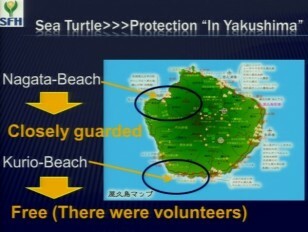 This research was carried out at the Yakushima island, in Kagoshima, Japan, in July 2012.We looked at Yakushima’s (wild) plants and sea turtles to compare with Yokohama’s (city). We did two researches there, Line transect and Vegetation. In the Line transect research in two beaches, we researched the trail of laying egg the shore’s sands, and the shore’s plants. About 200 turtles come to lay eggs there. In the vegetation research, we learned a lot about native plants.